What's an IDEA Lab Exactly??? By now you've hopefully heard the buzz about our newly redesigned space up in the HW Resource Center (library, for you newbies! ), called the IDEA Lab. Todd Burleson, our Resource Center Director and IDEA Lab Creator, worked tirelessly all summer alongside parent volunteers to transform the old computer lab area into our own version of a "maker's space" -- a space for our kids to explore their imaginations, gain new skills and turn their ideas into reality. From robotics to sewing and crafts to engineering -- the IDEA Lab at HWS features more than 25 pieces of high-tech educational equipment...it's a a sort-off "libratory" full of possibility! The library ("RC") side of the space now features new, modern furniture that is kid-centric in design. The RC also has research stations equipped with iPads and laptops -- and of course, the same treasured book collection the kids know and love. Also new, the WGST kid-produced and kid-anchored TV news station moved up from the school basement and now lives in its own space attached to the IDEA Lab. Separate from but related to the IDEA Lab, HWS now has a Project Room located in one of the old kindergarten rooms on the first floor. The Project Room is outfitted with an amazing assortment of supplies and materials, to allow classes to create large-scale, messy projects in an open space. Todd Burleson will keep us up-to-date on everything transpiring in our new spaces through his blog (see "What's The Big IDEA?" below). Also, stay tuned for opportunities throughout the school year for both parents and kids to experience the IDEA Lab together. In the meantime, here is some terminology, so you know the lingo your kids use! RC=Resource Center, our school library. IDEA Lab=The space located within the RC that will be a 'Tinkering Workshop.' The space will be home to everything from toilet paper tubes, tempera paint, hammers and nails to electronic circuitry kits and robots. A cart of laptops will allow the space to be converted instantly to a 'computer lab' again. Additionally, iPads and chromebooks will round out the technological compliment. TMI=Think, make, improve -- the overarching approach to "design thinking," which is how our kids will be encouraged to use the IDEA Lab. Project Room=The space for BIG explorations by students. A dedicated space for students to get messy, creative and use their imagination. A flexible and fluid space that can easily and quickly be reconfigured to meet the needs of projects. Want to get involved with the IDEA Lab? The PTO is putting together a new IDEA Lab Committee to make sure this amazing endeavor has all the support it needs to thrive. Please contact Sarah Graham (sdgraham@gmail.com) you are interested in joining. Also, the IDEA Lab needs YOUR special skills and talents to help with specific IDEA Lab projects! Are you a skilled photographer? Do you have a talent for sewing? Please contact Sarah Graham (sdgraham@gmail.com). Specific skills needed are: sewing, photography, computer engineering/coding, computer app/game design, video production/editing, robotics, circuitry and electrical engineering. It's a great opportunity to share your knowledge with the students! Tuesday, September 8th, during the school Town Hall Meeting. This celebration is for students only and will mark both the 100-year anniversary of our school and the kick off of the Decades Project. The party will include allergy-free cupcakes and environmentally-friendly balloons! Love the IDEA Lab already? Try A Little Tinkering At Home! 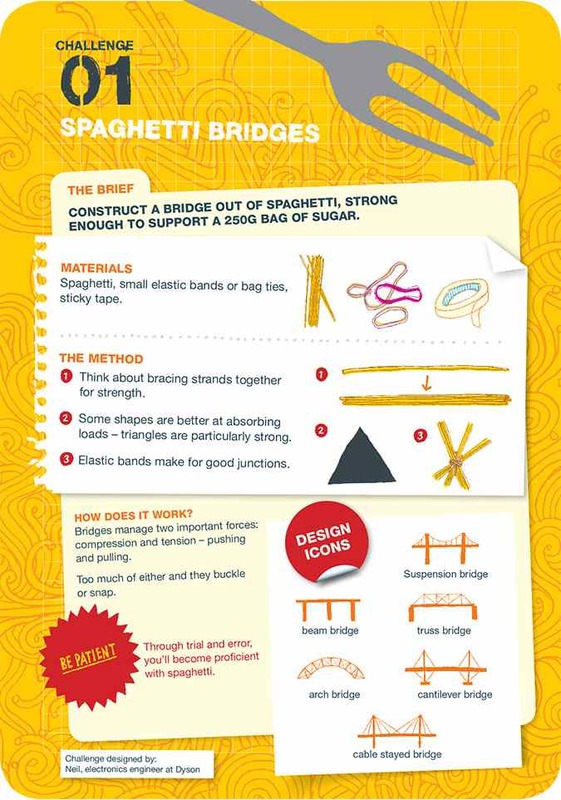 Challenge #1: The Spaghetti Challenge from the James Dyson Foundation. Click here for directions. Then the PTO has a spot for you! We're looking for 2 people to collaborate with our veteran Yearbook Chair, Jennie Ely, on this year's yearbook, with an eye to chair the committee next year. Jennie has masterfully crafted our school yearbooks for the last 8 years (4 as yearbook chair). She knows the ins and outs of this extremely important position. This is a perfect opportunity to shadow her, learn from the best and create a lasting memory for your child and the school. Please contact Jennie Ely with interest or questions at jennie.ely@comcast.net. The Item is Tuesday, September 15. Submissions should be sent to hwitemeditor@gmail.com. The first Pizza Fun Lunch will be Friday, September 11th. An enormous thank you to the Hubbard Woods Custodial staff: Clive Lascelles, Denis Myers and Guillermina Villegas. Your hard work and dedication to the school makes so many things possible that otherwise would not be. Specifically, thank you for all you've done to aid Todd Burleson and the parent volunteers in setting up the IDEA Lab and Project Room spaces. We're so grateful for you. We cannot thank Todd Burleson enough for offering his brilliance - not to mention his summer! - to create the Hubbard Woods IDEA Lab...a labor of love, a legacy, and an inspiration for our school district and beyond. We're amazed by you Todd. So many elements incorporated into the new Project Room space have come from our brilliant faculty at Hubbard Woods School. Thank you especially to the Project Room Committee that put in many hours and much thought on our behalf: Lynn White, Jason Sheets, Jean Bierner, Krista Wray and Gary Wendt. back-to-school fees. What a game-changer! Also, a big thank you to Erin Donaldson and Kendal Reis for their tireless efforts organizing, writing and emailing all of our back-to-school communications. We appreciate you keeing our Hubbard Woods community informed about everything happening at school. Great work Dee, Erin and Kendal!